At the National Day Parade (NDP) every year, there is always a contingency of people marching alongside the military and other government bodies that have contributed to Singapore’s success. They move with comparative ease while the military uniformed groups march stiffly in order. These men and women are part of the Labour Movement in Singapore – the National Trades Union Congress (NTUC) – the movement with a mission to help our working people get better jobs, better pay and better lives. SG50 is a big year for them, as it is for Singapore, and as they began their celebrations on 1st August, you begin to learn so much about them. While most of Singapore waits for the long weekend to arrive, the Labour Movement had already beguntheir SG50 celebrations on 1st August. 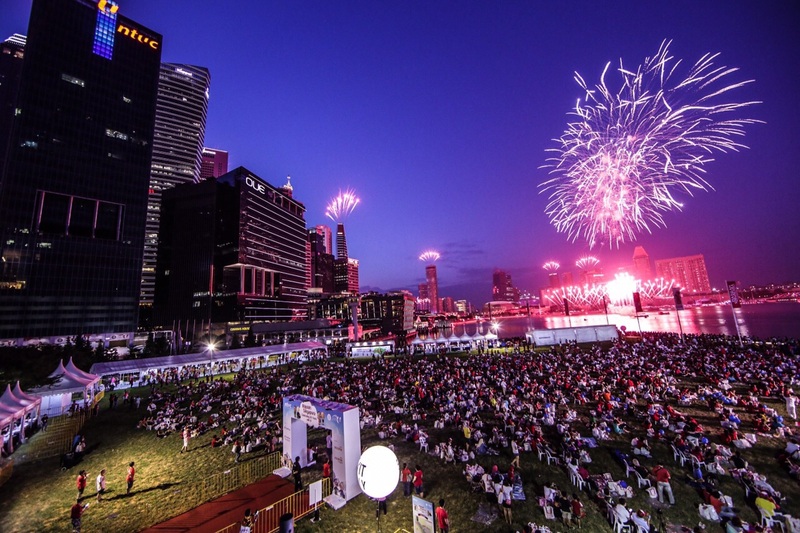 In the first event alone, over 5,000 unionists gathered with their families at The Promontory for one of the largest National Day Observance Ceremonies (NDOC) in Singapore — an annual celebration where NTUC unionists and members pledge their allegiance to the country. Nothing quite shows the strength and size of a movement like 5,000 unionists. But the upcoming celebrations are only going to get bigger. They’re expecting about 20,000 participants from 60 unions to come together to celebrate the nation’s 50th birthday in a series of SG50 activities organized by NTUC this month. Together, they represent over 830,000 workers who are union members, all of whom are dedicated to build on what Labour Chief Chan Chun Sing calls the Singapore Brand, the quality that makes international companies want Singaporean workers in their staff. You heard that right. NTUC will be organising the largest gathering of SG50 babies — 500 of them, to be exact. On 8th August, parents will turn up at the Baby’s Day Out event with their babies and toddlers to celebate National Day together. With over 8,000 attendees expected to attend, you don’t need more evidence that NTUC wants to care for workers’ families too. And if things can’t get any more baby-fied, NTUC’s Secretary General Chan Chun Sing will also be taking part in a Mass Baby Orchestra performance, along with NTUC President Diana Chia and NTUC FairPrice Chief Executive Officer Seah Kian Peng. What’s a baby orchestra? Something like this, I hope. During a speech given by Chan Chun Sing, he shared that the backbone of the Labour Movement, tripartism, was created in the spirit of unity rather than conflict. While the concept behind tripartism may seem difficult to understand, it basically stands for the power of cooperation from the three parties of government, businesses and workers, rather than conflict, when solving labour problems in Singapore. This three-way harmonious relationship is something that Chan Chun Sing has pointed out as unique to Singapore, and may be our winning advantage. “At a recent International Labour Conference held in Geneva, it was apparent to us that unionists from other countries were worried about many things that we often take for granted – good jobs, sustainable wage growth and harmonious industrial relations. Many could not build up a strong tripartite culture because of the lack of trust and continuity in their Government and its policies. Many of these policies were dictated by short-term political considerations rather than the long-term interests of the workers. In some countries, companies would actively avoid working with unions. Ultimately, it is the workers that suffer, as the economy stagnates and the number of quality, available jobs decline. In Singapore, we have taken a different approach. The Labour Movement believes that cooperation and not confrontation is more beneficial to our workers. We understand that the best way to take care of our workers’ interests is to build and sustain a successful economy with steady creation of good jobs with good pay for our workers. We achieve these through strong tripartism where the Labour Movement works closely with Government and companies to provide a conducive environment to attract quality investments, while ensuring that our workers are fairly rewarded. Yes, there is a tripartite pledge. If you thought having a National Pledge was enough, you might be surprised to know that the Labour Movement also has its own, They unionists renewed their commitment to helping workers in Singapore with cooperation and to “preserve industrial harmony” during NDOC last Saturday. so as to achieve prosperity and progress for all. Sounds familiar? Along with the SG50 celebrations, the Labour Movement also released a collection of 50 Ways The Labour Movement Shaped The Workforce. Dating back to the year of independence, it details interesting anecdotes that show the differences between the workforce then and now. One particularly interesting anecdote is that NTUC started Comfort, the taxi company, in 1971 to help get illegal taxis off the streets. This company eventually went on to become ComfortDelGro Corporation Limited, one of the biggest taxi companies in Singapore. With 50 years of progress behind us, it’s often hard to see how small changes shaped our current standard of living. But it’s small actions carried on doggedly and continuously like a computer course held by MINDEF in 1982, or BEST courses that taught basic Math and English, that helped to keep Singaporeans employable. This, continues now in the form of SkillsFuture, or what NTUC calls Future-Ready Skills. The Labour Movement wants to be able to anticipate the future and start offering training in Future-Ready Skills to the working people so that all of us can remain competitive in the global economy. The only ways to continue our nation’s winning streak in the global stage are (1) to ensure quality in our products and services, (2) to continue to innovate and yes, (3) to sustain the trust that people have in the Singapore Brand. We’ve always been taught that Singapore came from a background of scarcity, and though we’ve grown to become a great metropolis today, we are still a tiny island off the coast of Malaysia, fighting to survive. The struggles that we face are different, but in Singapore’s Jubilee year, it’s hardly the time to stop fighting. As the Labour Movement continues to help Singapore workers, it’ll take work and perseverance to grow the Singapore Brand to see SG100.